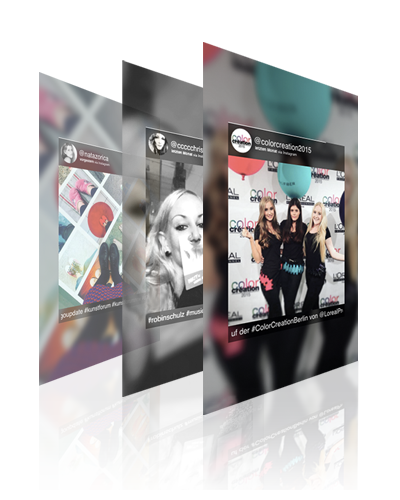 With our Hashtag Livestream you bring social media into the real world. After posting an Instagram or Twitter photo with your custom hashtag, it appears on your event displays in no time. Your benefit: We actively engage your guests into the brand communication. With every shared post you maximize your social media reach. Take a photo via Instagram or Twitter. The post appears live on your event displays. POPULAR FEATURES OF THE LIVESTREAM. We don’t let your guests wait. New posts appear on the displays in no time. Place for your message. Upload up to 5 visuals into the stream of your slideshow. You define length and duration of each slide. Besides Instagram we also track Twitter content. Tweets are smoothly and chronologically added to your Instagram feed. With the MINTANO Control Center. You decide which content will be displayed in your Livestream. In your office or on the way – with our easy to use Control Center you always keep track of new posts. Easily remove certain images or block users. You have no time? Don’t worry – we’re here to help. By request we take over the monitoring of your hashtag campaign. Put your guests into the spotlight.